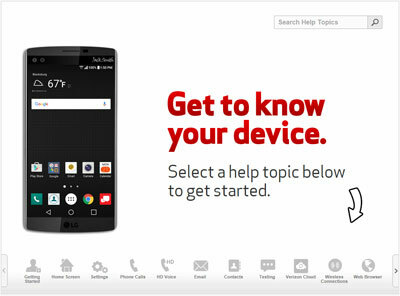 Find device-specific support and online tools for your LG V10 for Android®. Here's how to sign up for the free 10-day trial of Call Filter from your Android smartphone. If you're not receiving calls, callers aren't getting through (e.g., fast busy signal, invalid number announcement, etc.) or they're getting an unknown party, view this. This provides instructions for forwarding calls to another number via the My Verizon website. Here's how to block your number from appearing on another device's Caller ID on a per-call basis. Here's how to edit how your name displays on someone else's Caller ID via the My Verizon website or app. Learn how customize the outgoing calls of each line in your company. Set up a unique name and image that will appear on compatible phones that you call. Here's how to remove Share Name ID from your account via the My Verizon website. Here's info on Caller ID spoofing which may help if you're getting calls from random numbers. Here's how to unsubscribe from Call Filter on your Android device. Here's how to add or remove a number from the block list via the Call Filter app on your Android device. Here's how to add a number to the Spam List when using the Call Filter app on your Android device. Here's how to enable the Spam filter when using the Call Filter app on your Android smartphone. Here's how to report a Spam or telemarketer number using the Call Filter app on your Android smartphone. Here's how to place a video call via HD Voice on your smartphone. Here's how to activate HD Voice on your Android smartphone. Here's how to place a video call over Wi-Fi - HD Voice on your smartphone. When turned on, Wi-Fi Calling may improve indoor call quality for your V10. Learn how to activate HD Voice with your LG V10 to place video and HD Voice calls. Learn how to make an HD Voice call for a clearer, more natural sound using your LG V10. An interactive guide on how to make a video call to a contact with HD Voice using your LG V10. Discover how to turn VoLTE Calling on and off for your LG V10. Here's how to view international usage details and charges via the My Verizon website (Prepaid). Learn about customizing the ringtones you hear when your phone rings and Ringback Tones others hear when they call your phone. Find out how to purchase, remove and manage them through Verizon Tones. Here's how to assign your Ringback Tones to a contact via the Media Store on the My Verizon website. Here's how to purchase Ringback Tones for your device. Here's how to delete a Ringback Tone via the Media Store on the My Verizon website. Here's how to buy Ringback Tones on a device. Here's how to adjust the greeting callers hear before your tone plays via the Media Store on the My Verizon website. Here's how to create or delete a Ringback Tone playlist via the Media Store on the My Verizon website. Here's how to edit a Ringback Tone playlist via the Media Store on the My Verizon website. Use the Visual Voicemail app to check your voicemail messages without placing a call. Play messages from your screen. Upgrade to Premium Visual Voicemail. Here's instructions on how to set up your Voicemail and greeting. Here's how change or reset your Voicemail password from your phone. Here's how to retrieve Voicemail messages from your device or another phone. Here's info on how to use your Voicemail service. Here's how to access the Visual Voicemail app on your LG phone. Here's how to check your Voicemail messages from the Visual Voicemail app, on your phone or a different phone. Here's how to forward a Premium Visual Voicemail message on your LG phone. Here's how to check for Visual Voicemail messages on your LG device. Here's how to play a Basic Visual Voicemail message on your LG phone. Here's how to reply to a Premium Visual Voicemail message on your LG phone. Here's how to add a contact on your LG phone via Basic Visual Voicemail. Here's how to delete Basic Visual Voicemail messages for LG smartphone. Here's how to record a customized Premium Visual Voicemail caller greeting on your LG phone. Here's how to reset your Voicemail password when locked out. Here's how to save a Basic Visual Voicemail message on your LG phone. Here's how to set up a Basic Visual Voicemail greeting for your LG device. Frequently asked questions about Wireless Emergency Alerts, including Presidential Alerts, Imminent Danger Alerts and AMBER Alerts. To manage emergency alerts (e.g., AMBER Alerts, etc.) for your device, view this info.